The story behind the origin of today’s game Battle Princess Madelyn is quite touching. When one of the designers of the game (Christopher Obritsch) was playing Ghouls ‘n Ghosts, his daughter Madelyn asked him if he could put her into the game. This inspired him to create a game for her based on Ghouls ‘n Ghosts which turned into Battle Princess Madelyn. While I am familiar with the Ghosts ‘n Goblins series of games, I can’t say that I have ever been a big fan of the series as I never had the games when I was young. The series is highly regarded even if it is generally considered one of the harder video game series of all time. Despite not being really familiar with the game’s inspiration, I was intrigued by Battle Princess Madelyn as it seemed to take a lot of inspiration from a genre of video games that you don’t see that often anymore. Battle Princess Madelyn is a faithful homage to an earlier age of video games like Ghouls ‘n Ghosts for both better and worse. We at Geeky Hobbies would like to thank Casual Bit Games Inc and Hound Picked Games for the review copy of Battle Princess Madelyn used for this review. Other than receiving a free copy of the game to review, we at Geeky Hobbies received no other compensation for this review. Receiving the review copy for free had no impact on the content of this review or the final score. Paying homage to the Princess Bride, Battle Princess Madelyn begins with Madelyn at home playing video games on her tablet. When her Grandpa arrives and sees her spending all of her time on the tablet he decides to tell her a story. He tells her the story of Madelyn, a princess and knight of a faraway land. Madelyn’s kingdom is in danger after an evil wizard arrives and kills Madelyn’s dog, Fritzy. Along with the ghost of Fritzy, Madelyn must travel throughout the kingdom on a quest to stop the evil wizard from destroying the kingdom. While I don’t have a lot of familiarity with the Ghosts ‘n Goblins series, it is quite obvious that Battle Princess Madelyn takes a lot of inspiration from the series. That is to be expected as the designers don’t hide the fact that they were inspired by those type of games while designing Battle Princess Madelyn. For the most part the gameplay is exactly the same. You mostly run around the stages throwing your weapon left, right, or up to destroy the enemies that stand in your way. There is also some platforming and light puzzle solving mixed in as well. When you reach the end of most of the stages you proceed to fight a boss battle. This can unlock special abilities or new equipment that will help you later in the game. People who are familiar with this genre of games should already have a pretty good idea of whether or not they will like Battle Princess Madelyn. If you have played games like Ghosts ‘n Goblins and didn’t like them (most likely due to the difficulty), Battle Princess Madelyn is not going to be for you. If you really enjoy this genre, I think you will love Battle Princess Madelyn as it is a new take on an old genre that you don’t see a lot anymore. The game is challenging and can be a reminder of what you have always enjoyed about the genre. As I haven’t really played a lot of games from this genre, I don’t really have much of an opinion of the genre. While I have issues with Battle Princess Madelyn (which I will get to later), I had fun with the game. The controls are precise where it is your fault should you take damage. The gameplay is not particularly innovative but it is fun. There is something satisfying about clearing out all of the enemies standing between you and your destination. Even though I don’t have any fond memories of the games that inspired Battle Princess Madelyn, I still enjoyed my time with the game. While Battle Princess Madelyn is quite loyal to the genre that inspired it, it does have some of its own tweaks to the formula that improve the experience. I think the biggest addition to the game is the inclusion of the story mode. The story itself is really well done which is a vast improvement over old video games that barely even had a story. The story is supplemented by a great pixel art style that pays homage to the SNES era of video games. The story mode also adds exploration mechanics to a genre that mostly just had you move right until you reached the end of the stage. Most of the worlds/stages in the game have multiple paths through them. Exploring allows players to find hidden items that will help them out in their journey. They can also find hidden paths that lead to additional boss fights or new stages. While this addition doesn’t drastically change the gameplay, it does make Battle Princess Madelyn a more enjoyable experience. In addition to the story mode, Battle Princess Madelyn includes an arcade mode. Instead of the exploration found in the story mode, the arcade mode is focused exclusively on the action. Like the original Ghosts ‘n Goblins games, the goal in arcade mode is to just keep moving right defeating the enemies in your path until you reach the end of the stage. While I preferred the story mode, fans of old school gaming may prefer the arcade mode as it is more like the games that inspired Battle Princess Madelyn. Outside of the two different modes, Battle Princess Madelyn includes a couple new additions to the gameplay that modernize the genre some. The game includes a life system. When you die you are resurrected to a nearby safe location and can continue your journey. When you run out of lives you are teleported back to the start of the stage that you are currently in. This makes the game a little more forgiving with regards to difficulty as you get several chances, but the game is far from easy. The other main addition is the inclusion of powers that Fritzy can use to help you out on your adventure. These abilities give you a little boost from time to time. Battle Princess Madelyn is quite loyal to the games of the era that inspired it, and for the most part this is a good thing. The only problem is that the game also shares a lot of the problems from that era. Fans of this genre that want a “pure” experience won’t mind this as it keeps the game authentic. The problem is that I prefer when these type of retro games include mechanics to fix some of the issues with the older games. I think you can fix some of the problems with the older games while still remaining loyal to their memory. I think the biggest problem with the game comes from the fact that at times the game has a real lack of direction. This problem mostly impacts the story mode. The game generally doesn’t give you a lot of direction on where you are supposed to go next. The game basically tells you where you are supposed to go and then leaves you to figure out where that is by yourself. The game has no map so you are basically stuck exploring the various worlds, which have multiple paths, until you find the right one. The game has occasional signs that point in a direction but you have no idea where the signs are leading you. This leads to quite a bit of wandering around as you try to find your next destination. Another issue the game inherits from the past is the difficulty. While I haven’t played enough games in this genre to compare Battle Princess Madelyn’s difficulty, I would say that the game can be pretty hard at times. I don’t mind the fact that the game can be hard as a lot of people enjoy difficult games. The problem comes from why the game is difficult. Most of the difficulty in the game comes from “cheap” deaths. You will regularly end up dying because an enemy hits you which sends you through the air until you fall down a pit or into another enemy/obstacle that automatically kills you. This is really frustrating and doesn’t feel fair. When you get hit it is usually your fault, and I don’t have a problem losing health. You should have the opportunity to recover though instead of being knocked down a pit and dying instantly. This could have been fixed if there wasn’t as much recoil when you get hit by an enemy. The game could have still been difficult without having to rely on these type of deaths. In addition to the cheap deaths, Battle Princess Madelyn inherits its puzzle design from games from the 1980s/1990s. Early on in the game you will enter a cave. So I made my way through the entire stage and reached what I assumed was the end. I hit an invisible barrier so I assumed this wasn’t where I was supposed to go. I ended up exploring the cave some more until I came upon a set of buttons on the opposite side of the cave. I pressed them and they appeared to not do anything. So once again I began exploring the cave and started to think that I was missing something. I was about to return to a previous stage as I thought I didn’t have something that was needed to continue on through the cave. It turns out at the beginning of the stage there are a set of symbols engraved into the wall that just look like scenery. It turns out you need to press the buttons in the order of the pictures at the beginning of the cave. I proceeded to press the buttons in the correct order which then opened up the blocked path from earlier. This puzzle was not difficult but the game doesn’t really indicate that it is a puzzle at all. Puzzle design has come a long way since the 1980s/1990s and I would have preferred that the game didn’t have to rely on older types of puzzles. Fans of old school difficulty will probably have no issue with these gameplay decisions as this is exactly what games used to play like. I personally think the designer should have modernized this portion of the game though. These mechanics just add frustration to the game for people that aren’t looking for a game with old school difficulty. The game could have still been difficult without the need for cheap deaths, a lack of direction, and unnecessarily cryptic puzzles. This was an area where the game could have significantly improved upon its inspiration. People who want a “pure” old school difficulty game will probably appreciate these being included, but it is going to frustrate people that don’t love “old school” gaming. I might have spent quite a bit of time talking about some of the more frustrating elements of Battle Princess Madelyn, but that doesn’t mean that it is a bad game. Battle Princess Madelyn is a great homage to a video game genre that you don’t see a lot anymore. Fans of old school run and gun platformers from the 1980s and 1990s, especially the Ghosts ‘n Goblins series, should really enjoy the game. The story, setting and artwork are all really well done. The gameplay is fun and satisfying. The game even finds some ways to improve on its inspiration with the inclusion of the story mode. The main problem with the game is that it doesn’t fix some of the problems the genre has had for a long time. The game doesn’t give you a lot of direction at times which can lead to you getting lost. The game also has its fair share of cheap deaths. I don’t mind the game being difficult, but it could have come up with a way that tested your skill without having to worry about bad luck killing you. 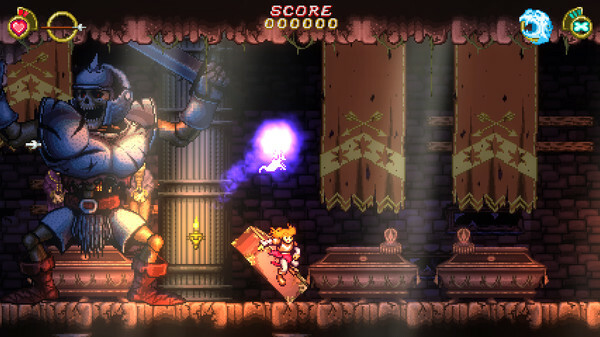 If you have never really cared for old school run and gun platformer games from the 1980s and 1990s, Battle Princess Madelyn is probably going to frustrate you and won’t be for you. If you are looking for a new take on an old classic video game genre though, I think you will really enjoy Battle Princess Madelyn. A great homage to video games of the past including the Ghosts 'n Goblins series. Adds an interesting story mode. The game has a lot of "cheap" deaths typical of the genre. The story mode gives you a lack of guidance on what you are supposed to do next.